Getting Started – Chattahoochee Horse Archers, Inc.
Will you be competing in the future? If yes, then make sure to get an actual horse bow, like a Korean or Scythian style, to take you to that level. Will you be shooting both left & right handed? If yes, then make sure you don’t get a bow with a shelf. Find your local archery/firearms store. If you live in the Gainesville area, check out Foxhole Guns & Archery where you can get 3-feather for $8/arrow or they can make you 4-feather (preferred for mounted archery) for $11/arrow. Teresa Rogers, with Chain Reactions Archery, custom makes these 4-feather fletched arrows, starting at $13/arrow. Also, check out Trey Slighting’s video on Facebook on how to prepare your nocks for Mounted Archery. Once you have calm acceptance of all of the above, you can do these same desensitizing exercises from the saddle. Reinless riding is paramount to your success as a horse archer. Teaching your horse to ride off your seat and legs can be a daunting task, but it is within reach! 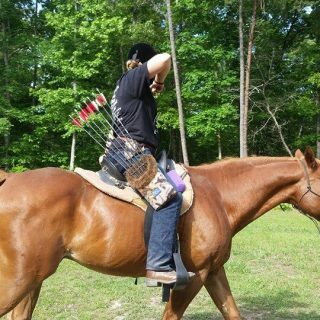 Xarchery Guy has some great insight on Horseback Archery and reinless riding on his websites so be sure to check them out! Standard course is 90 meter long track, with three targets, spaced at 30 meters apart for three side shots, set back 7 meters from the track. This track has a 14 second par time. Check out http://www.horsebackarchery.info/ for additional courses used in competition and for practice.